Raita is an excellent tri-doshic topping for rice, curries, dahls and soups, as a dip for samosas, falafels, naan bread or parathas, or as an accompaniment to pretty much anything piping hot, or too bland, salty or spicy that needs a cooling, creamy, flavourful counterpart. Delicious! Seedless cucumbers work best for this, but if using cucumbers with seeds and tough skin, peel first and scrape out seeds. Stir all ingredients together. Eat. Enjoy! *The raw garlic and ginger make this otherwise cooling condiment, spicy and pungent. For a truly cooling raita (also best for Pittas), omit these and keep it simply yogurt, cucumber and mint with just a touch of salt. 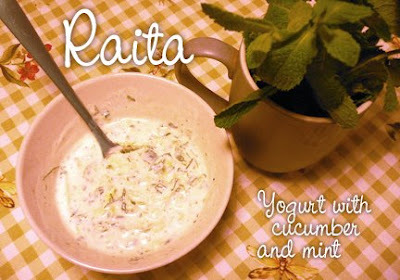 cucumber raita is my all time favourite. As cucumber is 1 of my darling fruits thats why i will love to do this recipe.